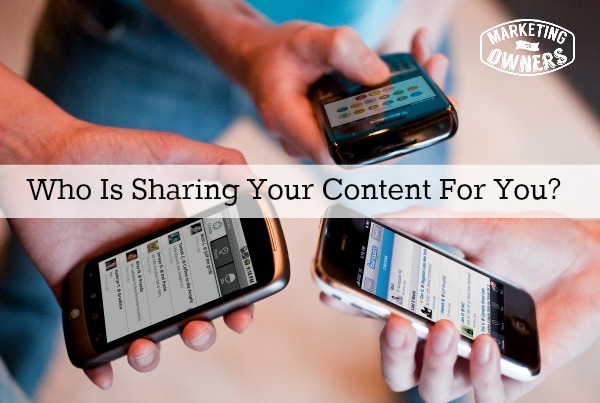 Who’s sharing your content? You are producing content. You are writing, you are blogging, you are producing up to date content on your social media aren’t you? I have mentioned it before, you’re not going to get get very far if you just stay static. You’re just going backwards if you don’t move, if you don’t update. So I ain’t going to assume as you are one smart cookie, then you are producing content in some manner. You are blogging, you are writing in some way. But, you won’t be able to get that out there on your own, unless of course you’re the BBC or CNN, the New York Times, or the Huffington Post, then you probably got a bit of a following, you’ll be okay. Let’s assume you’re not, that means you need help to get your content in front of the people that you want to see it. So, how do we do that? Well, we’re going to use that magic R-word — relationships. Now I use it a lot, because relationships is where you get to know other people in your space, or association — someone can do a quid pro quo, a win-win — the type that will help you scratch my back I’ll scratch yours, et cetera, et cetera. For example, you may have a customer who has a very lively blog. Generally, by the way, the people you wish to show your content, the ones that you want to put the most effort into asking, are the ones with a larger following than yourself. Obviously you want the others as well, but you wish to concentrate initially on the ones with the larger following. Go for the big money first, that’s what I’d say. So, how about some ambassadors? You must have some customers that probably have a good following. Give a list of your top followers. Go to someone like Fiverr, look up “data entry” or “research task”. Find someone who does two or three hours’ work for $5 on Fiverr, give them a list of the names of your top 50 clients, or your top clients, and ask them to go out there, and in that time, find as many social media presence — their Facebook page, their Twitter page, Twitter following handle, and note down the number of likes, follows, et cetera, to find the bigger ones. Be sure to give them a little detail like the website so they find the right one, because that could be embarrassing. But go ahead and find those, and then pick out the large ones. Find out if they have a blog, if they write. But if they got Twitter followings they probably put out content. Then simply get in touch and say, “Hey, we write an article about blah, blah, blah, blah,” because your articles are not going to be all me, me, me, me, me — so they’re going to be for the reader, not for you. People love bonuses. If they’re using you anyway, it means they like you. So, offer them something in exchange for leveraging their client base and their following. Okay? That’s one. Then, of course, I’m always talking about influences. Just do the same exercise, but find influences in your trade. Talked about it before, go to sites such as Topsy, and BuzzSumo, places like that. Find big blogs on Google, or in Technorati, Bing, Yahoo, search. Doesn’t have to be done in five minutes, this is something you do overtime, and build a spreadsheet on, and just keep it. Find influences, and contact them. Don’t contact them with every single thing you write. Write quality. Provide something, that if they shared it to their following — they are not promoting you, they are just saying, “Here’s a good article.” So, only offer things that don’t, that aren’t self-promotional, okay? In your articles, provide great information, answer customers’ questions, answer questions that are, should be in the minds of your target audience. Don’t promote yourself. When they share, it will have the link to your website, ’cause that’s what they’re going to do. You’re not going to give them the article, by the way, you’re going to give them the link to your page, so they’ll say, “Oh, here’s a good one.” That gets people to you — you don’t need to mention you. Think of, think about this. It’s a very popular way of doing it. Big deal. Or, they could say, “Sure,” or they might even say, “Thanks.” You never know. Really does, does happen. It’s what everyone else is doing, the ones that are working the system, and doing well. Anyway, I did mention it’s a Monday, so we need a book for the week. This week, we’re going to have a look at LinkedIn. 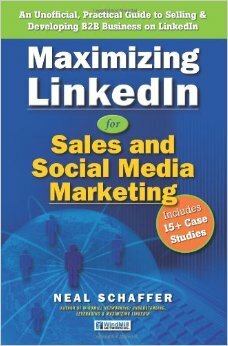 There is an excellent book called Maximizing LinkedIn. It’s actually got a longer title, I can’t remember the rest, but if you just look for Maximizing LinkedIn by Neal Schaffer, you will find it. Neal is great. I like him because he practices what he preaches. He, in his book, he teaches very practical methods to make the most. It’s a very popular book. So be sure to go and check it out and then let me know what you think! Who can you ask to help share your content?